Piles of clippings and weed invasion indicate this lawn is mowed improperly. Mowing has a major impact on lawn appearance and health, yet is often overlooked in terms of importance. Homeowners need to follow a few simple guidelines to assure lawns are being mowed properly. One very common mistake is mowing lawns too short. For most lawns, a mowing height between 2½ to three inches is suggested; the upper range is best for summer. Lawns mowed at higher heights tend to have deeper roots, less weed problems, and look much better. Mowing too close invites problems such as weed invasions. Simply raising the mowing height can have a major impact on the quality of many home lawns. A height of two inches is fine when grasses are rapidly growing, but the height should be raised as growth slows, stress increases, and when the lawn is in shade. Lawns should be mowed according to the rate of grass growth; remember not to remove more than one-third of the grass leaf in any one cutting. Mowing as the lawn needs it is essential. In the spring, this will likely mean more than once a week. It is never advisable to mow when the grass is wet. Another issue related to mowing is whether clippings should be collected. As long as the lawn is mowed on an as needed basis and the one-third rule is followed, clippings will readily filter back down into the lawn, and need not to be collected. The clippings readily decompose (they contain 75 - 80 percent water) and do not cause thatch. Clippings also recycle nutrients, in particular nitrogen, so less fertilizer is needed. The newer mulching mowers create even finer clippings, recycling the nutrients more often as the smaller clippings decay faster. Mulching mowers do not perform at peak efficiency if the lawn is too tall (removing more than one-third of the grass blade) or if the lawn is wet. Selecting a mower can involve a number of factors, many being personal preference. Rotary mowers are the most widely used type on home lawns. Conventional rear or side discharge rotary mowers with bag attachments and mulching mowers are readily available for homeowners. A study at the University of Illinois showed mulching mowers did not provide any additional benefit over conventional rotary mowers. Another critical area overlooked by homeowners is maintaining a sharp mower blade. A sharp mower blade will cut the grass blade cleanly. This gives the lawn an even appearance and reduces disease from damage caused by a dull mower blade. Mow in the direction that is safest. Periodically change directions if desired, although mowing the same direction each time should not be a problem on taller turf typical of home lawns. The first and last mowing of the year can be slightly shorter, not so short that you scalp the lawn. 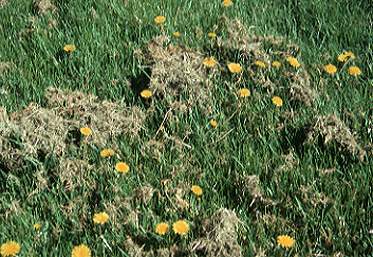 Scalping in spring and allowing the grass to remain excessively high at the end of fall encourages weed and disease problems.